The job workloads of general-purpose multiprocessors usually include both compute-bound parallel jobs, which often require gang scheduling, as well as I/O-bound jobs, which require high CPU priority for the individual gang members of the job in order to achieve interactive response times. 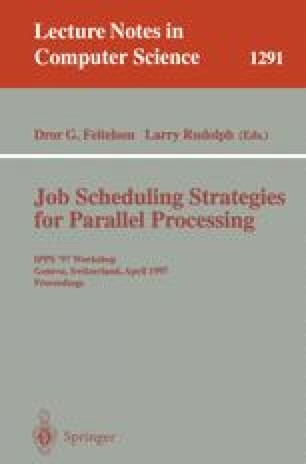 Our results indicate that an effective interactive multiprocessor scheduler must be flexible and tailor the priority, time quantum, and extent of gang scheduling to the individual needs of each job. Flexible gang scheduling is required because of several weaknesses of traditional gang scheduling. In particular, we show that the response time of I/O-bound jobs suffers under traditional gang scheduling. In addition, we show that not all applications benefit equally from gang scheduling; most real applications can tolerate at least a small amount of scheduling skew without major performance degradation. Finally, we show that messaging statistics contain information about whether applications require gang scheduling. Taken together these results provide evidence that flexible gang scheduling is both necessary and feasible.